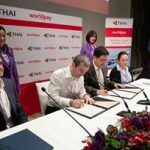 Thai Airways International (THAI), the flagship carrier airline of Thailand, has selected Worldpay, Inc. (NYSE: WP; LSE: WPY) as its international payments partner, as it targets overseas growth. To support its sustainable growth strategy, THAI needed an experienced partner to help it manage the complexities of cross-border payments and optimise the online booking journey across both mobile and desktop. Worldpay, a leader in card and alternative payments with global coverage, was selected for its international reach and unrivalled experience in the airline industry. Worldpay works with 88 of the world’s biggest airlines and has more than 25 years of experience in the sector. Consumer preferences are changing: while flights have traditionally been booked using credit cards, alternative payment methods (APMs) are growing in popularity. With 28 percent of Thai consumers using bank transfers as their preferred method for shopping online, the ability to offer local payment options will allow companies to make the most of Southeast Asia’s second largest economy. Additionally, global mCommerce penetration is set to rise from 38 percent in 2018 to 49 percent in 2022, which suggests that mCommerce is on track to overtake desktop sales by 2023. To adapt to this shift, Worldpay will support THAI in widening its breadth of payment methods and transaction currencies to appeal to the changing purchasing patterns of customers. THAI will initially focus its payment optimisation efforts on Australia and Europe – two key markets for the company. In Australia, the carrier’s passenger traffic is growing by two percent year-over-year, while in Europe passenger traffic is growing at a rate of 2.5 percent each year. A range of APMs such as iDEAL, Trustly, SOFORT, and Giropay will be rolled out over the coming months to make it easier for European travellers to book online. The THAI payment team will then expand their initiatives to India, China, and the rest of Asia Pacific.